Sometimes, you can’t find the movies you want to watch on LG TV, you maybe download it online then try to play it on LG TV via USB. But situation will occur that even your video is MP4 file, you still perhap can’t play the MP4 files on LG TV via USB like the below. "In my LG 55UB085T, most of the mp4 videos not working. Its says Unrecognizable File format. However same files works on other old tv and players. Why my LG TV can’t play MP4?" Why Can’t LG TV play MP4 Files? Actually, MP4 is listed as LG TV supported video format on LG official website, LG TVs are particular about what audio and video codec inside in the MP4 video container. 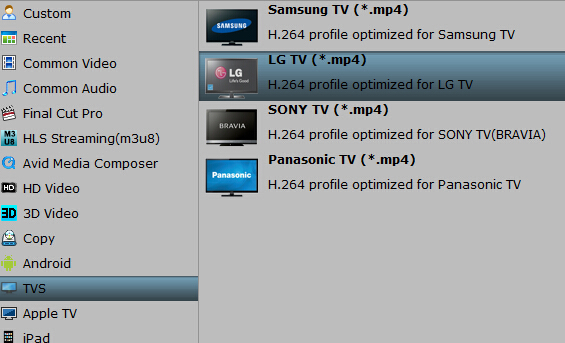 LG TV only supports playing MP4 in H.264/MPEG-4 AVC video codec and AAC audio codec. LG TV MP4 issues are also affected by MP4 video resolution, frame rate, bitrates and etc. How to Play All Kinds of MP4 files on LG TV via USB? It is easy to successfully play all kinds of MP4 on LG TV whatever via USB drive. Since the MP4 video and audio codec are not supported by LG TV, you just need to re-encode the MP4 files to LG TV playable ones. For this purpose, you’re highly recommended to adopt Pavtube Video Converter Ultimate, which is capable of convert MP4, AVI, VOB, TiVo, FLV, MTS as well as MKV to LG TV friendly file format without quality loss. Plus, it offers kinds of preset profiles for LG TV, Samsung TV, Panasonic TV, Sony TV, Apple TV, etc to meet your different needs. If you are Mac users, please turn to iMedia Converter for Mac. How to Convert MP4 to LG TV for playing via USB? Start MP4 to LG TV converter and drag .mp4 files to the software interface to import the file. It supports batch conversion so you can add multiple MP4 files. Click Format bar and choose “LG TV (*.mp4)” from “TVS”, which can be recognized by LG TV perfectly. To play videos directly from a USB flash drive connected to a USB port on a LED TV, the video should be in DivX HD format. Depending on the model, the TV may support DivX 3, 4, 5 and 6. It also supports AC3 Dolby Digital files, EAC3, HE-AAC, MPEG, PCM and DTS. And choose 3D MP4 for LG 3D TV and HD H.265 MP4 for LG Ultra HD 4K TV. Advanced settings: With the right settings you can retain the quality of the original video while also saving space. This is particularly helpful when streaming over your network. Simply click Settings bar and you can tweak the settings to your satisfaction and even save it as preset. 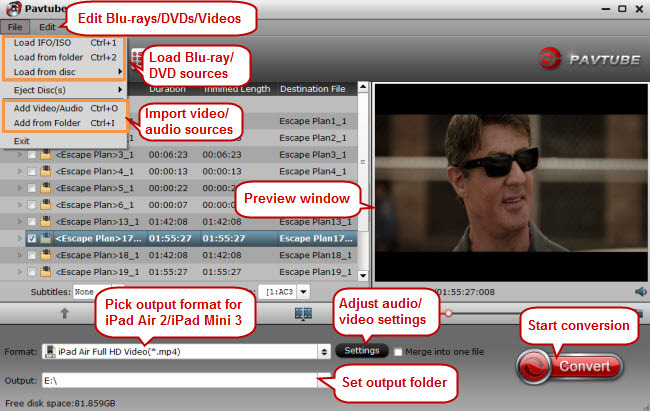 Edit MP4 video for LG TV: Click “Edit selected task” to open the Video Edit window to achieve editing MP4 like trim, crop, rotate, add image/video watermark, effect, subtitles, etc in the corresponding editing pane. 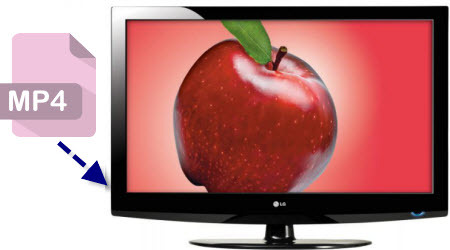 Convert MP4 to a LG TV supported format by clicking the “Convert” button at the bottom-right corner of the main window. This MP4 to LG TV Converter is highly efficient and it will finish the video conversion in minutes. After conversion, click “Open” to get the converted videos. Now, transfer the converted MP4 files to USB drive then insert the drive to USB port on LG TV for playing. Apart from playing MP4 files on LG TV via USB, you have another 3 ways to stream your MP4 files on LG TV. ← Previous Previous post: How to Play 2K or 4K MP4 files on Vizio TV? Next → Next post: Can Vizio TV play AVI movies from USB?